Letter of recommendation, just like the SOP, should tell the story about you. It should be unique and exclusive. For some universities, you just need to mention your recommender’s email address in the application form. Later, your recommender will get an email which contains a form/link to a questionnaire/few direct questions which need to be addressed by him/her. In most cases (when the recommender don’t know you well enough or if they don’t have enough time to write it for you), the recommender will ask you to send a draft LOR so that they don’t have to write the whole recommendation letter. Check your university course requirements to see if they have asked your LOR to be in any specific format (many times they upload a pdf file which needs to be filled by your recommender e.g. TUM LOR). Note down the limit for LOR length e.g. 200 words, 1 page etc. Check how many LORs are requested. Also, note down who should be the recommender (e.g. your Professor, Project manager). Most of the Technical Universities only accept recommendations from your college Professor. Think of 2-3 people who can give you a good recommendation. That means (i) You have attended their lecture or worked with them in the past (ii) they know at a personal level (not necessarily, e.g. college dean) (iii) They are in a respectable position in the organization. Write to them politely asking if they can write a positive letter of recommendation for you. You may also send a copy of your transcript etc. reminding them of your good performance in their classes. Take an appointment with your recommender and ask if they need any additional information in writing the recommendation letter. You can also explain them things like why are you interested in applying for a particular course, to a particular university etc. Think from your recommender’s perspective. Let the draft be in the appreciative tone but do not exceed the boundary on any occasion. There should be a mention of how long and in what capacity the recommender knows the student. Include some statistics in LOR. e.g. The student was one among top 10% of his/her class. This is an important piece of information for admission committee. If you have to prepare multiple drafts for different recommenders, make sure that you entirely change the content with minimal overlap. Lastly, remember that you can embellish the truth in any way you like, but don’t write false/untrue statements. This is disrespectful to your recommender and by doing this, you might even offend them. 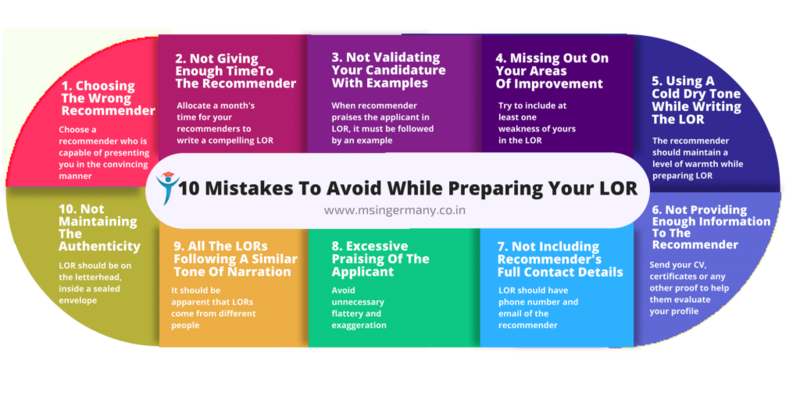 Once your recommender hands you the final LOR, make sure that it is stamped, signed and sealed (if necessary). Thank them for the recommendation and ask them if it is okay to use their email address for online recommendations. Note down your recommender’s personal email address. Keep in mind the type of university you are applying for before sending the LORs. For example, LORs from your college professor is more valued in TUs since they are research oriented. Similarly, LOR from your manager will be valued more in a Fachhochschulen (FH) since they are more practice oriented. In general, the LORs from your work or studies carried out in recent years carry a higher value. 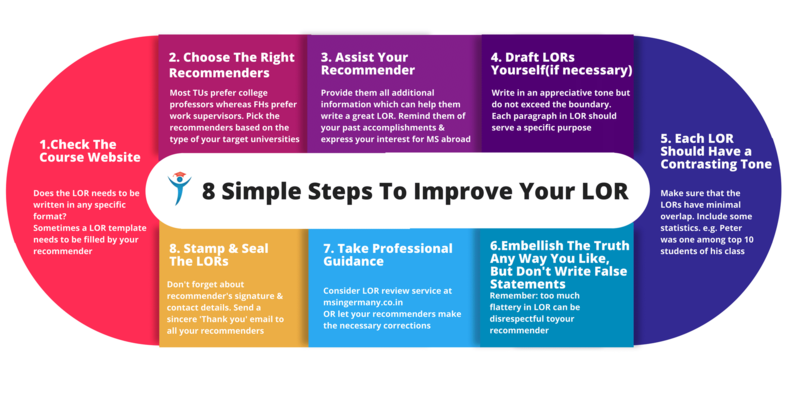 Your LOR should be written on your university’s letterhead. It should be attested by the respective department and signed by your recommender.